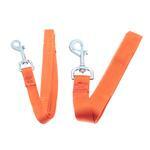 The Barking Basics!® Dog Leash in Orange is a durable and classic design that is perfect for any outing. 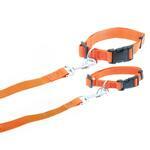 This Barking Basics!® Dog Leash in orange is a staple for any dog's walking wardrobe. Each dog leash features a nickel-plated swivel clip for a quick and secure attachment. Matching collar sold separately. 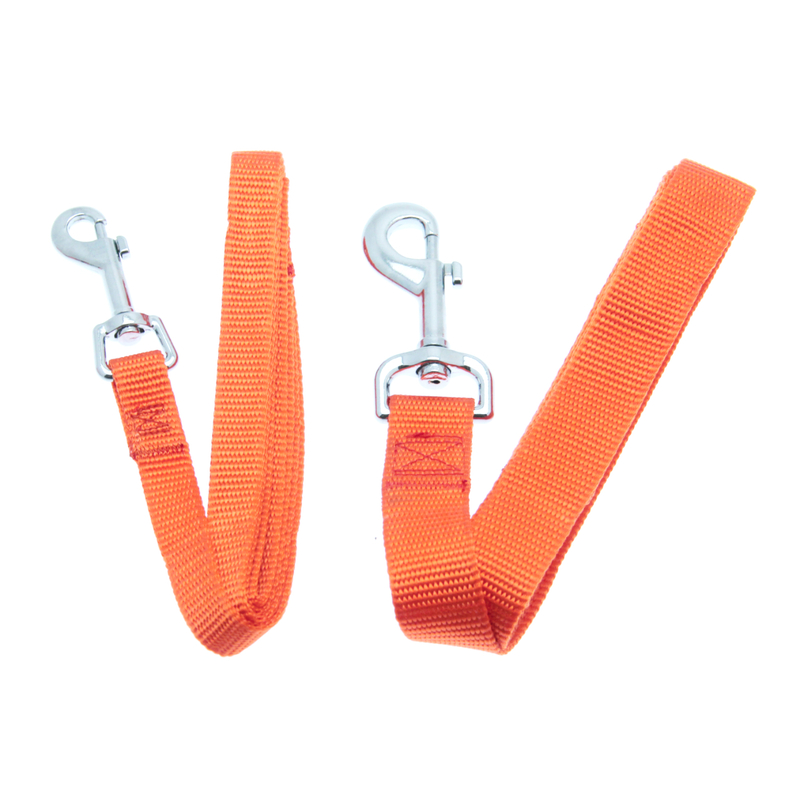 This orange-colored leash is great because it's easy to spot. It's also a popular choice for fall and Halloween. Our orange leash and other Barking Basics products will also move your pup to the head of the team by sporting team colors! Football fans that will love our orange Barking Basics leashes, collars, tanks, and hoodies include the Chicago Bears, the Cincinnati Bengals, the Cleveland Browns, the Miami Dolphins and, of course, our very own Denver Broncos. Posted On 04/21/18 by Kimberly S from , Yes, Kimberly S recommends this product! Perfect size for small dogs. Love the color! Love the the brightness and they look great! We enjoy our walks and love to show of the matching leash! This dog leash has been a great help to walk my dog, it's well made and easy to wash and dry. I purchased the 6' length. The clip was a little heavier than I had hoped. Otherwise description of item matched on-line pics. I wish it had been available in the 6' length but in a narrower (less than 1") width. Price was ideal. Perfect orange that goes with previous items purchased. My puppy will strut her stuff. This is a great little leash. Great size. Perfect transactions. Posted On 12/07/16 by Karen L from Middleville, MI Yes, Karen L recommends this product! This is the size of leash I always use with my borders. If I use the longer ones, they tend to pull me every which way. Also I like the width of this leash - smaller widths tend to cut off my circulation. Vibrant colors too. Ordered one each of almost every color. Posted On 12/07/16 by nancye t from natick, MA Yes, nancye t recommends this product! Quite happy with this purchase. Wanted another smaller leash that was easy to find quickly. The bright orange color is perfect. Leash is well made and just as described in the catalogue. Posted On 09/20/16 by Maria G from Spring, TX Yes, Maria G recommends this product! I got this basic leash bc they were out of the festive leash I had wanted so I got this one and turns out it looked cute with all his other matching halloween stuff I ordered since it was the same tone of orange and liked it even more bc its a extra long leash where he doesnt have to pull on me if im at a slower pace. I got this orange leash to go with the orange collar that my boy already has. And they look great with his orange tee. Hard to find color. I needed orange leash to match a puppia harness. This is a nice orange shade. Good quality leash. Posted On 02/29/16 by Mary S from Thousand Oaks, CA Yes, Mary S recommends this product! 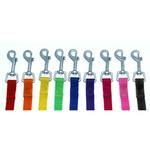 Barking Basics leashes are a great quality and vibrant quality. They wear well too. I have two in most colors. Well made! Love the color. My twins will look great in their matching leashes. Good sturdy leash! Affordable price. Have couple for the cars and each door. Posted On 12/06/15 by Veronica H from Hilton head, SC Yes, Veronica H recommends this product! I saw this darling orange leash and decided to get a start on new year for Halloween. It is just perfect! Well worth the price. Can't beat the price in any petstore. Leash is fine. Durable. Would recommend you buying one. Posted On 09/17/15 by Sue H from Dewittville , NY Yes, Sue H recommends this product! I bought Libby an orange collar and matching leash. She is all set for the bright colors of October and Halloween. Love both items! I really like the site, especially the clearance prices on name brand products.